In particular, the possibility of thinking oneself into a landscape, finding equivalences, echoes, reflections and inversions of thought in the passage of weather across formations of land – each an expression of forms of time in which we find ourselves, and each a form of score or notation. How can geological time be thought together with the transitory passage of weather? How do we understand the duration of our experience in relation to either the very fleeting changes in atmosphere, or the imperceptible change and impossible timescales of the rocks around and beneath us, and how do we locate ourselves in it? How can we visualise or extend into a landscape remotely? Rickards will present two of her own works over the weekend, and discussion will open out from these. 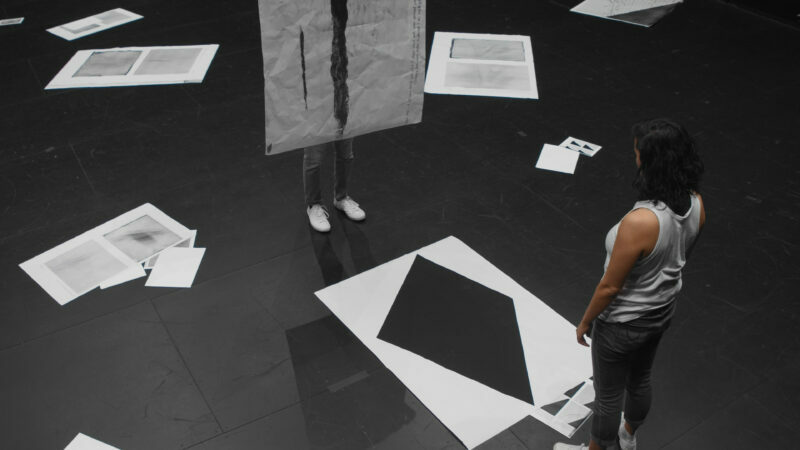 Her latest work One can make out the surface only by placing any dark-coloured object on the ground (2017) will be screened alongside an experimental sharing of contextual texts and images. Rickards will also show her work Grey light. Left and right back, high up, two small windows (2014). The weekend will conclude with a group walk to link some of the group’s thinking to movement. Rickards’ work deals with perception and its description; with how one can translate an encounter, be that with a sound, an object, a space or an image. It is centred on the framing of description in language, gesture and sound. Key to her practice is the relationship between either temporary or permanent elements in a landscape and the perception of groups or individuals to a landscape as a whole, with the sites concerned being used as both a vantage point and a stage for examining our verbal, spatial and gestural relationship with our surroundings. The outcomes, be they video/audio installations or text-based works, are often edited or composed with musical structures in mind, examining how a landscape might be read as a score, how it might affect one’s utterances, movements, and perceptions of scale, distance and material, particularly in instances where those measures by which we locate ourselves in space become uncertain. LUX Scotland is pleased to offer one bursary place for a SUPERLUX member to take part in the summer school. This will cover the cost of the summer school including accommodation and meals, as well as travel to/from Hospitalfield. To apply, please email scotland@lux.org.uk with a statement of no longer than 250 words about why this residency would be useful for your practice and current research. Applications must be received by 10am on 26 July in order to be considered. The bursary holder will be notified by 5pm on 26 July. The bursary holder will be asked to provide a short reflection on the summer school, which will be shared on the SUPERLUX website following the event. SUPERLUX is LUX Scotland’s professional development programme for artists. This programme offers workshops, masterclasses, reading groups, advice sessions and other learning activities for Scottish-based artists and curators working with the moving image. The summer school at Hospitalfield is part of our SUPERLUX programme. Hannah Rickards was the recipient of the Max Mara Art Prize for Women in 2008/09. A survey of her work was held at Modern Art Oxford in 2014. She has presented solo exhibitions at the Whitechapel Gallery, London; The Showroom, London and the Fogo Island Gallery, Newfoundland. Her work has been exhibited at the Walker Art Center, Minneapolis; Palais de Tokyo, Paris; Witte de With, Rotterdam and the South London Gallery.